Back in August 2018, I wrote a post about the strong connection between the Italians of the town of Cento, Italy and the Plymouth Cordage Company in From Cento to America. At that time, I mentioned a web site created by the Archivio di Storico di Cento (the historical archives of Cento) that would be launching in the near future to share stories of those who left Cento for other countries around the world. That day has arrived. 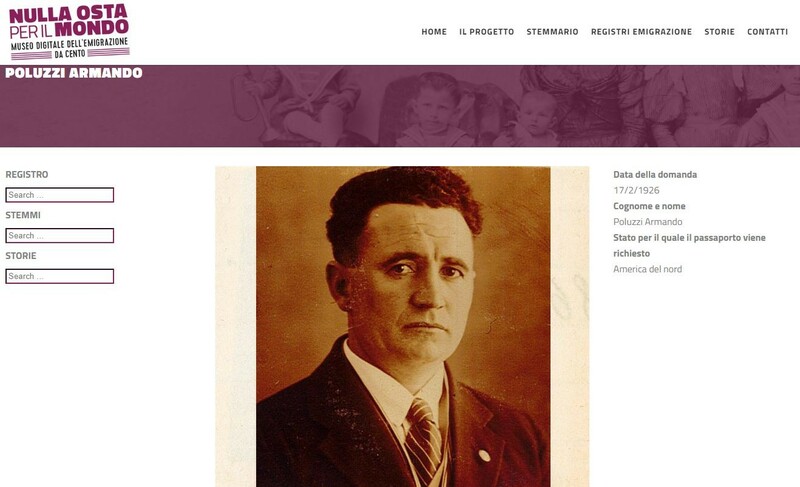 Nulla Osta per il Mondo, Museo Digitale dell’Emigrazione da Cento went live 31 January 2019 with the Archivio di Storico di Cento announcing it to local schools first and then more generally later in the evening. There is an English home page as well here. As someone who has been eagerly awaiting the launch of this site on which stories of emigrants will be shared, I was thrilled to see it come to fruition. In addition to the stories, there is a section, Registri Emigrazione (Emigration Registers), where photos of some of the pages of the earliest register – from 1899–1900 – can be found along with actual passport photos and brief details from the registers of emigrants 1926–47. If you click on the passport photo you can see an enlarged photo, but if you click on the name of the emigrant, then you are taken to a page that gives you the date he registered for the passport, his (or her) surname and given name, and the country to which they were planning to go. Some of the pages are available in English, including the stories. The information from the passport registers is currently only in Italian, but the countries are recognizable, for instance America del nord (North America), Stati Uniti (United States), and Francia (France). Also, it is important to remember that in Europe, when you see a date such as 10/2/1926 this is actually 10 February 1926. For the passport registers, if you find someone that could be a relative, it may be possible to request a digital scan of that information from the register page itself. There is usually more information, including names of parents, found in the original register. There is information about what you must submit in your request on their Contact page, including the email address for these requests. Due to their laws, it is necessary to include a digital copy of your photo ID with the request. If you were hoping that the historical archives might also supply you with civil registration records (births, marriages, and deaths), these are not housed in the historical archives. For those you would need to reach out to the Ufficio di Stato Civile (directly translates to office of civil status, but in essence the vital records office) for the town of Cento. An email for this office is also included on the Contact page. This new web site will open a door to perhaps learning more about your ancestors who came from Cento and its frazioni (hamlets): Alberone, Buonacompra, Casumaro, Corporeno, Dodici Morelli (sometimes written XII Morelli), Pilastrello, Renazzo, and Reno Centese. Cento’s civil records of birth, marriage, and death have never been made available through FamilySearch, so having access to some information through the emigration registers is a major step forward. Additionally, perhaps the best part of this site is the opportunity to share stories of those who left Cento. Who knows what cousins you might be able to find through the stories? And it is sincerely hoped that as things continue to grow on this new site, descendants of emigrants from Cento will consider sharing their memories of parents, grandparents, or even great-grandparents who went looking for adventure somewhere beyond Italy. If you worry that you are not a writer, please don’t let that stop you from sharing. I encourage everyone who has connections to reach out to me at rmcclure@nehgs.org – we can put something together so that your family is remembered and so that those who remained in Cento and its hamlets may learn about those who left. All too often, once a family member went to another country those who remained behind ultimately lost contact. I know of many individuals here in the United States who are meeting Italian relatives for the first time and forging new relationships that hopefully will continue from generation to generation. 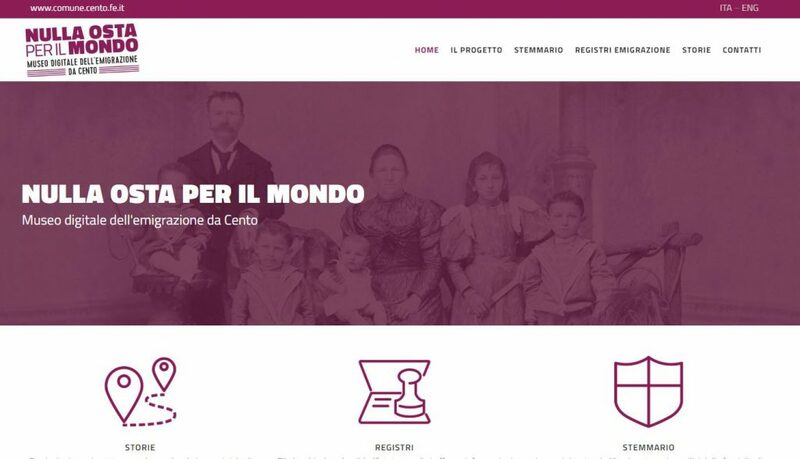 The launching of Nulla Osta per il Mondo, Museo Digitale dell’Emigrazione da Cento and the historical archives’ wishes to partner with organizations such as NEHGS, sharing the information in their collections, just exemplifies how the Internet is making genealogical research easier. And while their records may not all be online, the ability to request those records in this manner, especially for an area in which nothing has previously been made available even on microfilm, is amazing. Personally, I’m hoping that I get tons of people reaching out to me. Are you connected to Cento? If so, let me know! It is very exciting to see this website! My Italianancestors came from much smaller towns in southern Italy. I was wondering specifically about the passport photos that are available on this site, do you know what time period they first start being included? Would you know if other towns would also hold these records on a local level? I am especially interested in finding photographs of three ancestors who traveled to the US and ultimately returned to Italy. One around 1885, one in 1913 and one in 1920 or so. Do you think I would have success looking at my own communes or is this much less common?